Recently I had the pleasure of meeting Holly Longsdale and Carlos Mora, producer and game designer respectively of EverQuest 2, for a virtual tour of Chains of Eternity. Holly narrated the tour while Carlos navigated. Chains of Eternity for those that don’t know is the ninth expansion for EverQuest 2 since its release in November 2004. Incidentally, they’ve just had their eighth anniversary. Personally, I have been playing off and on since 2006 and it has always been one of my favourite titles. Fironia Vie, the beautiful high elf protagonist of EverQuest and EverQuest II that is featured on every box has died. Or has she? Fironia Vie is lying in state in the Greater Faydark in a new memorial which is where we started our tour. Working with the Duality and Revanus a tear has been opened in the Feeroot to allow the inhabitants of Norrath to pass through to the realm of the dead, Ethernere. 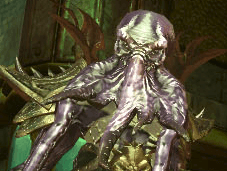 Ethernere is the dominion of Drinal, the Silver Reaper, and is being overrun by the Harrowing Horde. The first zone the player encounters in Chains of Eternity is Eidolon Plains, and while it resembles the Feeroot with its lush jungle vegetation and rich colours, it is clear that you are definitely not in the Feeroot. There is a chilling sound whispering through the trees reminding you that you are in the realm of the dead. The Harrowing Horde, once protectors of the realm, have seemingly gone mad and the effect is taking its toll. The skies have turned red and the trees have eyes. Obal Plains, the other overland zone in Chains of Eternity, will be familiar to most. It does seem like it should be Loping Plains in spots but, again, something is not quite right. Areas within Obal Plains such as Hallow Cleft and Breathledge have been overtaken by the Harrowing Horde. Obal Plains is lusciously done in blues and purples with a gorgeous haunting soundtrack. One of the best features of Chains of Eternity is that the signature lines will be completely solable, allowing everyone to experience the complete story. Players will also be able to get to adventure and crafting levels of 95. Guilds, too, will be able to level to 95. Crafters will see the introduction of prestige abilities such as Experimentation which allows the crafter to add new stats to an item, Salvaging which turns items into pure resources, or Mass Production which allows the crafter to make multiples of the same item at once. There are nine new dungeons in Chains of Eternity all with their own unique feel. For example, in Ethernere players will find the Temple of the Faceless, the Dreadcutter and Drinal Citadel (Harrow’s End). The Dreadcutter, while we didn’t get to visit it in our tour, Holly Longsdale seemed particularly excited about the ship citing the full experience of the moving sails as well as hearing the flapping of the sails, adding to the overall immersion of the area. Outside of Ethernere there is Wyrmborne Crag which is home to the Ashlok. Wyrmborne Crag is cleverly done with even more attention to detail. Because the Ashlok are nocturnal their abilities change at night. This is yet another example of the level of design in Chains of Eternity. 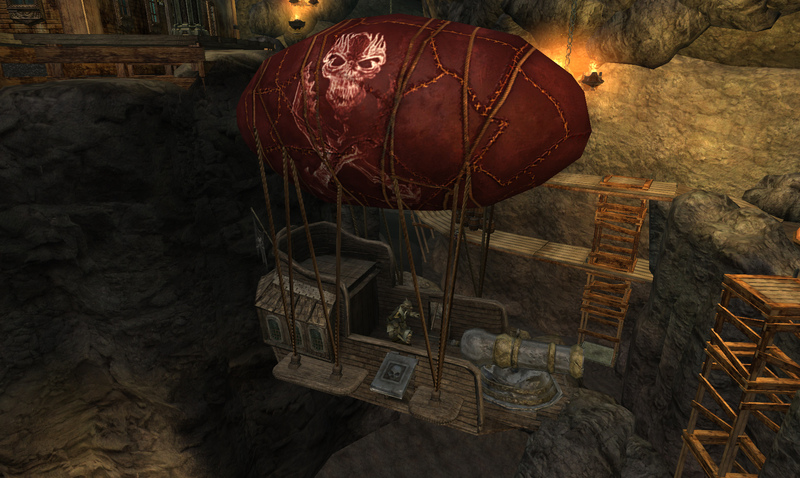 This area has a real feeling of depth not just in space (though that is quite impressive) but again in the details such as the Ashlok running and jumping on the platforms overhead, or the flags blowing in the breeze. The zones in Chains of Eternity have a different look and feel to them than other expansions. There is a richness of colour and fine detail that hasn’t previously been seen. Sound is also taking more of a role. Spirit stones are a new adornment item that can be found in Chains of Eternity. Spirit stones will grow in power as they are used and may open unique passive abilities. As well as spirit stones there are level 95 weapons that drop throughout the new zones. While these Ethereal weapons are considered to be the best in game, they are also quite a rare drop. In addition, Holly also mentioned that the platinum limitation has been removed for free players so that they may participate in the Krono market which has recently gone live. The Player’s Studio is moving right along and the team are getting ready to put submissions in the game. Chains of Eternity will be released on Wednesday, November 13th. If you haven’t picked up your copy yet there is still time. Just head on over to the official site http://www.everquest2.com/expansions and get your copy today.